Mid-winter in the Megunticook Watershed is a fabulous time to get out and shake those blues. The temperatures may be cold but if you dress properly it’s fun to play on the ice. 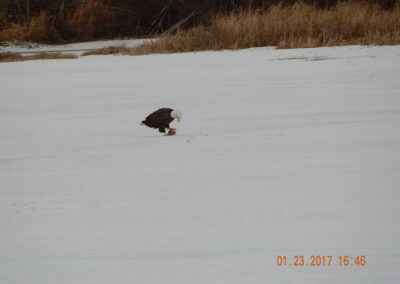 While skating, fishing or just hiking the shoreline there is a good chance you’ll see the bald eagles. They visit the watershed looking for an easy meal of fresh fish left on the ice. 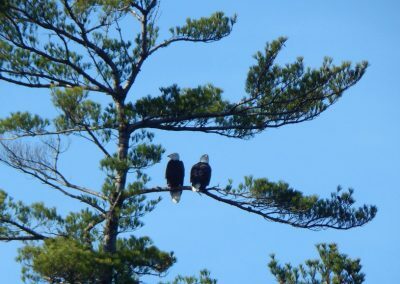 The eagles will sit in the trees waiting for the opportunity to grab a fish. While lots of fun can be had on the ice it’s best to use some caution and common sense. Ice depths can vary greatly on the same lake or pond. The Megunticook Watershed is a flow thru system with slight currents moving during all seasons. Just because you can’t see the current, it’s still there. Narrow areas increase the current and erode the ice. This can be seen at the outlet of Norton Pond at the Bailey Bridge where the current keeps it ice free all winter. Next, the flow gets pinched at the narrows around Lutz, Little and Narrows Islands. This area will ice over but is a known thin spot. Another place to stay away from is around the Fang Islands Narrows, this area has open water most winters. 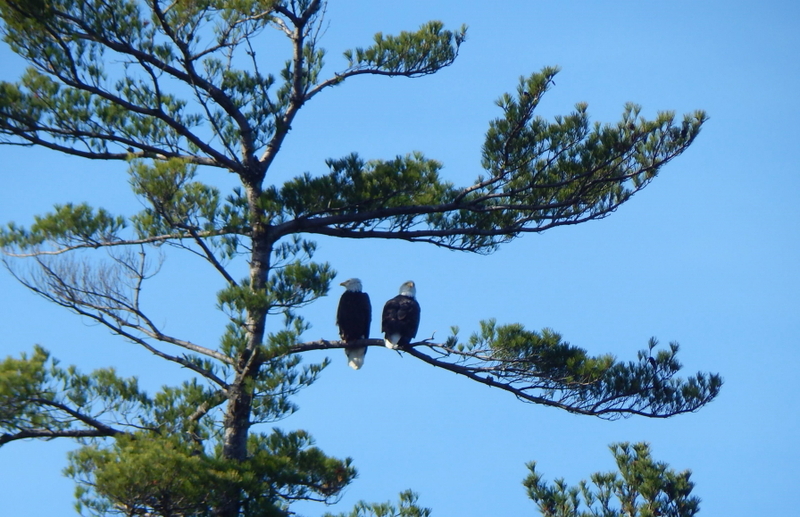 Finally, be cautious near stream outlets and the East and West Megunticook Dams. These areas can be unsafe all winter long. I have seen Cars and Trucks on the ice at both Norton Pond and Megunticook Lake over the last few weeks. 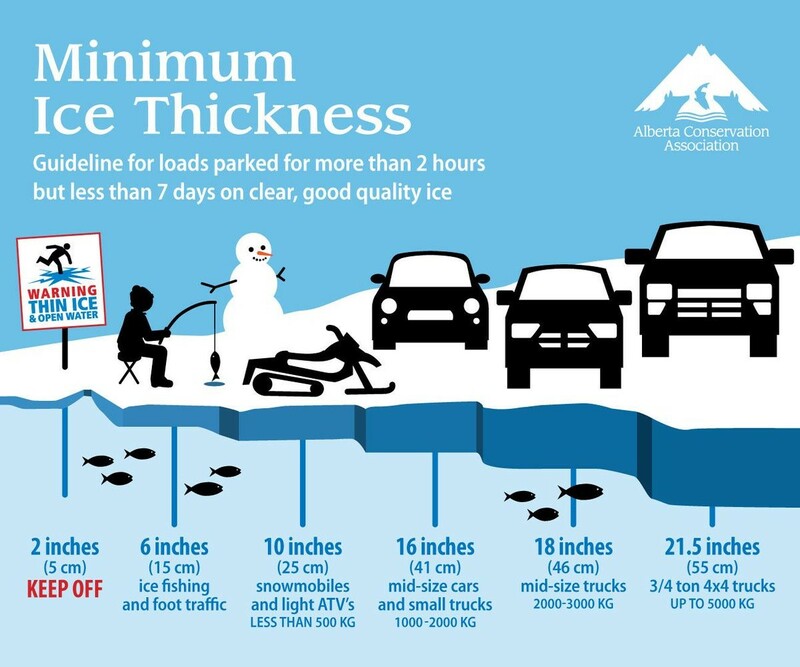 Again, use caution out on the ice and test ice thicknesses frequently. The chart at the top of the page is for loads parked on the ice and how long you can stay. The Farmers Almanac states the minimum safe ice thickness for a small car (4000 lbs) is 7.5 inches. However, to park your car for more than 2 hours (a day out fishing) you should have 16 inches. That’s a big difference that most folks don’t consider when driving on the ice. I have not seen 16 inches of ice on Megunticook or Norton this winter so far. The ice on Norton Pond was about 12 inches recently. 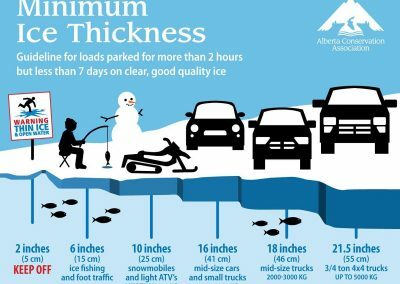 Remember, you are responsible if your vehicle breaks thru the ice, and it can get very expensive (state fines) if left on the bottom for too long. A google search says that cost of removal is $1000-$5000 depending on the where and how deep, and the auto maybe a total loss. But you still have to get it out even if it’s not worth it. Please take this into consideration when heading out onto the ice with your vehicle. Generally good ice conditions have been great for outdoor activities and I have seen a number of ice shacks around the watershed this winter. All fishing shacks or structures including tent styles that are on the ice must have your NAME and ADDRESS in 2-inch letters PAINTED on the outside. Also, all shacks must be removed PRIOR TO ICE OUT or 3 days after the close of the ice fishing season. If you leave your shack you can be charged for the removal. The landowner where the shack is left or ends up can destroy or remove it and recover any cost from the owner in a civil action. Have fun, be safe and leave a plan with friends or family. Tell’em Where, When and How long you`ll be gone. Don`t Hibernate get outside!